Years ago when I was low on money during the holiday season, this is the song I would sing. I Wanna Buy Christmas Gifts But I Don’t Know How To Pay! While my bank balance is still a sad story, I no longer struggle when it comes to holiday shopping as I know how to enjoy Christmas on a budget. Holiday shopping can be difficult especially if you’re planning on enjoying Christmas on a budget. You want to save money on Christmas gifts but you don’t know how to. If you’re struggling to save money on Christmas presents then worry not. You’re not alone. Most people overspend on Christmas. They buy the wrong item at the wrong price and end up with no money for Christmas. Do not be that person and look for tips on how to enjoy Christmas on a budget. Here are the 11 best tips to save money on Christmas gifts this year. This is the most important holiday shopping tip anyone can ever give you. Budgeting allows you to know how much you can afford to spend and keeping a tab on your spending lets you figure out your next move. Budgeting is not as difficult as it often sounds on paper. It’s all about writing down the amount of money you can afford to spend on Christmas gifts so that you don’t end up with no money for Christmas. But doing it manually can often be a hassle. I suggest that you use Tiller instead. While you will be doing some work, Tiller will automatically pull your transactions in for you. All you have to do is categorize them using a drop down menu. It’s as simple as that! And even better, they have a free holiday gift tracking spreadsheet for you to use. However, remember that merely making a budget is not enough. You must make sure to stick to it. Once you have created a budget, you can move to shopping. Let’s have a look at some Christmas money saving tips. For most of us, Christmas is the biggest holiday so why not make it grand and start saving in advance? 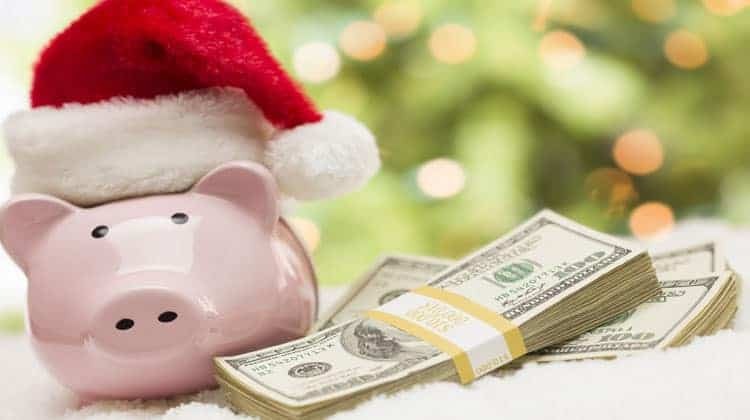 You can have a Christmas savings plan under which you can save a small amount of money every month to ensure you have a good amount of money by Christmas. Your budget will come into play here as well. First of all, you need to know how much to save. Next, you’ll need to know how much you can easily save per month without affecting your needs. It’s easier to save a small amount every month than to save a lump sum amount around Christmas. According to a survey conducted a few years ago, we spend about $830 on gifts. This means you’ll have to save only about $70 per month to accumulate $830 by the end of the year. However, $830 was the average. About 30% spend over $1,000 and about 17% spend less than $249 and prefer to save money Christmas shopping. To make sure you have the money come the holidays, be sure to put the money into a dedicated savings account. I love CIT Bank because they are easy to use and they pay one of the highest interest rates out there. This means you will have a little extra money to spend on gifts come December! You can click here to open your account. Online shopping can help you save money in a lot of ways. First of all, most online stores offer products at discounted rates. In fact, many companies even offer special rates to push people to shop online. In addition to this, online shopping has other benefits as well. You get to save time and money you’d spend going to the mall. However, be careful about picking the right store. You should ideally go for one that offers free shipping and promises to deliver the products on time. You may also opt to get the items delivered directly to the recipient to avoid shipping costs. Other than this, when you shop online you also don’t end up spending money on food and drinks as it’s common for shoppers to eat out when they step outside to shop. This can cause the budget to go haywire, hence online shopping is considered a better option. If you do opt to shop online, it is a must to use Ebates and Swagbucks. Both these sites offer cash back when you shop at your favorite retailer. In fact, Ebates offers a huge Black Friday sale where every store offers double cash back! This means you are earning anywhere from 2% up to 50% cash back on your purchases. Last season I did all of my Christmas shopping online through Ebates on Black Friday and I walked away with over $100 in cash back! You can sign up for Ebates for free through this link. New users even get a free $10 gift card! But this doesn’t mean you should overlook Swagbucks. They too offer cash back and sometimes they offer more than Ebates. I like to compare the two and use the one that offers me the highest cash back. You can sign up for Swagbucks for free through this link. New users get $5 when you sign up! In addition to the cash back trick above, there are still other ways to save money when shopping online for Christmas gifts. Just about every online retailer runs promotions to cash in on the Christmas season. Just pay attention to the promo codes listed on the website. But you should also do an online search too. Many times there are juicier promo codes out there. Some stores will even allow you to stack offers. To find these codes, just do a search for the retailer name along with “promo code” or “coupon code”. Lastly, sign up for the mailing list of stores you plan to shop at and follow them on social media. Many times they will offer exclusive deals through these channels. Just be sure you unsubscribe and stop following them after the holidays. Otherwise you will get deals and be tempted to spend money you shouldn’t be spending. You should also waste no time and find all the possible discounts so that you can get a deal that you find the most appropriate. A good option is to signup for newsletters so that you can know of any special sales or discounts. It may sound a little strange to some readers but it is possible to find free Christmas gifts. The idea is to find “Buy 1 Get 1 Free” and other such offers. Some companies also give away free Christmas gifts. If you are low on budget, you may choose to give these gifts as Christmas presents because something is better than nothing. This may not be the most ideal way to buy or select Christmas gifts but if you’re low on cash then it can turn out to be a feasible option. The only downside is that you may not get to customize gifts or pick what you’d like for each individual. Still, free Christmas gifts can be a viable option. You can find such deals by looking online and being a little observant. If you’re a DIY expert then come up with creative Christmas gifts for your loved ones. When it comes to making your own gift, there are no limitations. You can make everything from a nice dress to a sketch to a painting. Pick something that you can do well and stick to your budget. Many DIY ideas are cheap. For example, a sketch can be a creative Christmas gift and only requires a piece of paper, pen, and your time. On the other hand, a gift basket would require you to buy individual items, pack everything in a basket, and wrap it. This can turn out to be a very costly item. So be careful when it comes to making your own gift. There are many creative Christmas gift ideas. The key lies in being creative and staying within your financial boundary. Bulk buying can be a good idea if you’re low on money. Many stores offer discounts on bulk purchases. If you see no such discounts then there’s no harm in writing to the company and requesting a special rate. You may be able to save up to 20% with this special trick. However, remember that you may not have the option to return products or take advantage of other such offers if you buy in bulk. This is why it is important that you consider all your options and speak in detail with the seller regarding the policies when it comes to bulk buying. Sometimes, all you have to do to get a discount is to ask for one. Many sellers are willing to offer a discount to buyers who are brave enough to negotiate or ask for a discount. Negotiations may not be possible when you buy online but make it a point to speak to the company regarding available offers. They may have promotions that you may not be aware of. Inquiring about the same can turn out to be very helpful when you want to save money Christmas shopping. On the other hand, your negotiation skills can turn out to be a powerful weapon when it comes to shopping from physical stores. First, inquire about possible discounts and promotions then try to negotiate a possible discount. However, remember that not all stores offer discounts as many follow a strict fixed price policy. There’s no point in trying your luck at such a store as it will cause you to only lose time and energy. There’s something unique about stepping out in the cold of December to shop for our loved ones. The crowded streets and sparkling lights are good on the eyes but bad on the pocket. Believe it or not, many items get expensive during the Christmas season and gifts are not an exception. The simple demand and supply phenomenon applies here. There’s more demand for gifts around Christmas time. As a result, some items may get more expensive, hence it may be a better idea to shop before the arrival of the season. If you want to enjoy Christmas on a budget then you must follow this tip. You may shop in November if you do not want to shop earlier. Cyber Monday and Black Friday are good options too shop as many stores offer discounts on these days. A major reason why people shy away from shopping in advance is due to the gifts being ‘out of date’ by the time Christmas arrives or not having enough space at home to keep the gifts. You can’t just leave them lying around. They need proper care. These problems have simple solutions. Go for an evergreen gift so that there’s no risk of the item looking dated. Secondly, you may choose a future delivery date if you have no place to keep the item. Many online and offline stores allow buyers to choose a future delivery date. This option can turn out to be very useful when you go holiday shopping. You can buy a gift in advance without having to worry about delivery. Finally, ask about the return policy. Many retailers extend their return period around the holidays. In most cases, you have until January 31 to return items bought around the holidays. The catch is that each store determines when they enact this return policy. So be sure to ask before you buy. Recycling can be a good way to save money and enjoy Christmas on a budget. You cannot recycle everything but some items can be recycled easily including wrapping paper. While it does not cost a lot you should still not neglect it as every penny counts when it comes to saving. Check out this detailed guide on how to recycle Christmas wrapping paper. A properly crafted list can help you save money on Christmas gifts by allowing you to buy only what you need. Calculate who all you have to buy a gift and allocate a budget to each. If possible, do some research and decide what you wish to buy each individual so that you have a clear idea. I suggest that you have 2-3 possible options for each individual so that you quickly know what to turn to in case your first priority is not easily available. Then make sure you take this list with you when you go shopping so you know exactly what you are buying. I like to take a picture of the list with my phone. This way in case I forget the list, I still have a copy of it when I go shopping. As important as the tips are that I outlined, you still need to know some general tips when you are out and about shopping. Research Before You Shop: Check online, visit multiple stores, talk to friends, and find as much information as you can regarding discounts and promotions before you make a purchase so that you don’t waste a single opportunity to save money. Buy With The Buyer In Mind: If possible, pick a gift keeping the buyer in mind. This may often be a bit difficult if you’re considering discounted or free Christmas gifts but a bit of hard work can help you find affordable and creative Christmas gifts suitable for the recipient. Don’t Buy What You Don’t Need: Do not splurge and only buy what you need to buy. Stick to the checklist, look for cheap Christmas presents, and never go above your budget. Do Not Buy Stuff For Yourself: Many argue that giving gifts is a waste of money but there are some forces more powerful than economics in this world. I love giving and receiving gifts and Christmas is the time when gifts become a necessity. If you follow the tips outlined in this post, you can have a great Christmas on a budget. If you do a little planning, you can save money on Christmas gifts and you might even be able to find free Christmas gifts. The bottom line is even if you have no money for Christmas gifts, you can still have a wonderful holiday season. Michael is a full-time freelancer and contributes to a number of sites. He's also running is own content writing firm, Michael Words, and loves to share his knowledge and experiences with others. In his free time he enjoys music, workout, and playing with his dog. Great suggestions! One thing that has really helped my budget is that the adults in my family are moving away from gifts to experiences. Rather than stressing about gifts for everyone, we go see a show, go out to dinner, or do a cheap weekend away. It ends up being much cheaper, less stressful, and we have a lot more fun! Super helpful, Michael! I think I usually end up stressing because I do wait until Nov/Dec to shop, so making a point to start much earlier could definitely help. Many great tips, thanks!